So what is the way out? How to compete with rival businesses? Don’t have a huge budget to spend on marketing?Feeling a little apprehensive about the success of your business? Clueless which tools to use to plan a smart marketing mix for your business? Take a deep breath and relax! Help is at your fingertips. StoreHippo, online store builder India understands how important marketing is for the growth and success of any business. So, we have added many simple but highly effective marketing tools in our platform to help you boost the conversion rate of your web store. StoreHippo offers an amazing discount engine that helps you manage your promotions and multi-tier discounts. Decide a set of deals in advance and roll out quick flash sales, limited period offers, combo offers, customer loyalty programme, redemption point, promotional sliders and banners etc to turn your visitors into buyers. Offer a variety of coupon codes to your customers and visitors by setting up various one time or multiple use coupons. Easily create the coupon code for bulk discounts, combo deals (buy one get one free), flat or percentage value and much more attract higher sales volume. To engage customers effectively with marketing tools for small business you need to create unique promotional pages quickly. To achieve this StoreHippo offers dynamic pages which can be created rapidly by pulling information right from your database. Creating marketing pages for a product is just a matter of few minutes. Additionally, StoreHippo also allows you to create dynamic forms which help you in capturing feedback or adding more customers for your marketing lists. Online shoppers have a short attention span and on an average 7 out of 10 shopping carts are abandoned by the customers. Also, shoppers have a tendency to browse products but reserve the final purchase decision for a time in future. If these orders are not followed up timely all these sales can go to some other competitor site. To get back your lost orders, StoreHippo offers many remarketing tools like automatically abandoned cart follow-up, remarketing tracking code etc which keeps reminding the customers of the products they surfed on your store. These internet marketing tools help in bringing back lost sales for your business. To get better conversions and bigger ticket sizes it is imperative that store owners have the flexibility to offer differential pricing to different customer segments. StoreHippo lets you maximise your profits by setting up differential pricing and offering discounted prices based on order quantity and customer location. You can also use pricing override feature to offer different prices to different customer segments. Mass promotional mailers are always on the top of internet marketing tools list for any business. Mailers help to keep your customers informed about latest deals and offers at very low cost. This is a time-tested tool that always gives good ROI. StoreHippo helps you offer promotional deals and offers to your customers by integrating trusted third party tools like MailChimp and Sendgrid. You can also create segmented user list from your dashboard to target customers in a better and more effective way through your mass mailing campaigns. Engaging your customers on the go using multiple channels is essential for better conversions. StoreHippo helps you achieve this through multiple notification channels like email, SMS, Web and Mobile push notifications. You can use all these channels to send marketing links and special offers directly to the mobile or web browser of your customers and bring them back to your site for immediate conversions. When customers find someone to interact with in real time they can be easily convinced and gently led toward a successful checkout. For this reason, having live chat on your site can greatly improve the conversion of your online store. StoreHippo top ecommerce platform helps you integrate third-party chat solutions and thus offer help and support to customers while they are visiting your web store. This tool greatly enhances conversion rates in real time. This is the age of social media marketing. Registering your presence across multiple social channels is essential to create a name for your brand. StoreHippo helps make social marketing easier for you by offering simplified social media integration and helping you decide on customized ads with the help of statistics and data collected through customer browsing history. StoreHippo is one of the few ecommerce platforms that offer a wholesome marketing solution by offering marketing services in partnership with reputed third party partners. SEO is the most important aspect of online marketing and better SERP ranking for every online business. It gives long term benefits and brings in constant organic traffic on a regular basis. StoreHippo offers inbuilt features to facilitate and enhance your SEO efforts. You can have unique URL for your product pages, meta fields, Alt tags, themes, blog etc that are optimized to rank your website higher on SERPs. This ensures more traffic and hence improved conversions. StoreHippo offers a gamut of marketing tools to improve your conversion rate. 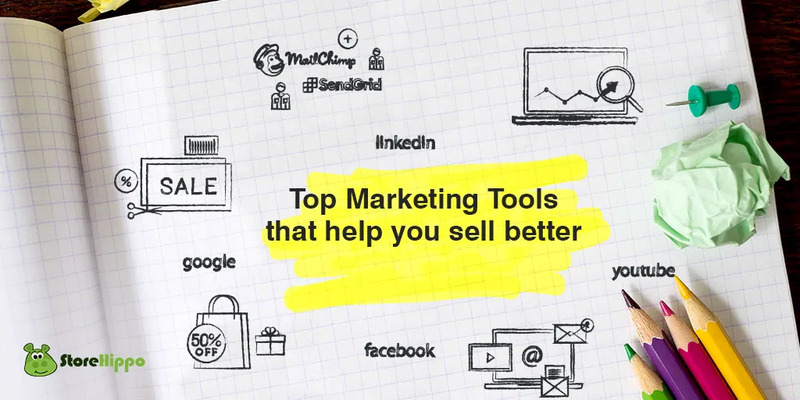 Now that you know the advantages and use of the various types of marketing tools, try and use them on your own store to get more orders and higher conversions. If you have any queries regarding any of these tools or the marketing services offered by us, leave a comment below right now.